Enjoy the comfortable design of this contemporary sofa sectional. It has plush cushions and soft upholstery and creates a sleek style with it track arms and soft gray upholstery. With its left arm facing chaise, this sectional creates an inviting atmosphere in any home. The Zella - Charcoal Contemporary Sectional Sofa with Left Arm Facing Chaise by Signature Design by Ashley at Walker's Furniture in the Spokane, Kennewick, Tri-Cities, Wenatchee, Coeur D’Alene, Yakima, Walla Walla, Umatilla, Moses Lake area. Product availability may vary. Contact us for the most current availability on this product. 7020016 LAF Corner Chaise 1 36" 82" 37"
7020067 RAF Sofa Sectional 1 71" 37" 37"
Enjoy the comfortable design of this contemporary sofa sectional from Zella. It has plush cushions and soft upholstery and creates a sleek style with it track arms and soft gray upholstery. With its long chaise that can be ordered for either side, this sectional creates an inviting atmosphere in any home. 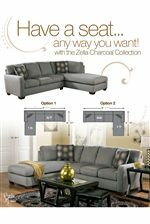 The Zella - Charcoal collection is a great option if you are looking for Contemporary furniture in the Spokane, Kennewick, Tri-Cities, Wenatchee, Coeur D’Alene, Yakima, Walla Walla, Umatilla, Moses Lake area.